John McCain was a ‘rat’ or ‘stoolie’ telling on other U.S. officers being held captive at the Hanoi Hilton prison. When McCain first went to Congress, members of Congress turned their backs on him and did not communicate with him because of this, and also how he disgraced the military and his fellow officers who were severely punished by the North Vietnam guards and commanders of the Communist prison by McCain ratting them out. I am also led to believe that McCain was referred to as ‘the canary’ by the other officers for telling or squealing on the others. If you search the internet you will find some of these articles about what McCain did to his fellow officers in captivity and the stories of the other brave officers who reported on McCain upon returning to the United States. He was also given special treatment by the communists while in prison because his father was a 4 star Admiral. Donald Trump was and is CORRECT! WMR has learned additional details regarding the deadly fire aboard the Navy aircraft carrier, the USS Forrestal, on July 19, 1967, in the Gulf of Tonkin. The additional details point to then-Lt. Commander John McCain playing more of a role in triggering the fire and explosions than previously reported. 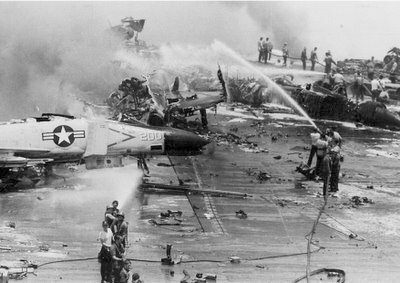 The fact that both McCains were involved in two incidents just weeks apart that resulted in a total death count of 168 on the Forrestal and the Liberty, with an additional injury count of 234 on both ships (with a number of them later dying from their wounds) with an accompanying classified paper trail inside the Pentagon, maybe all that was needed to hold a Sword of Damocles over the head of the “family honor”-oriented McCain by the neo-cons. (7) McCain said in 1973, he sustained his ordeal with his “love for his wife”. In a matter of months, he had dumped her for a woman 1/3rd his age whose father owned the Coors Beer franchise in Phoenix. (His good friend Senator Kerry, about the same time, dumped his wife after fornicating with Jane Fonda.) McCain also has a secret “wife” in Hanoi and an illegitimate son. (10) If the “Crowned Prince” of the “Plantation” does not stop his outlandish lies about his “torture”, several of his fellow POW’s “will” soon break their “code of silence”. McCain is a brainwashed Manchurian candidate who has fawningly supported Hanoi and the Communist Bloc countries ever since he entered Congress. The man is a liar, a traitor, and a crook. Any senator who uses the word “scumbag” 20 times a day addressing his employees is not fit to serve. He and those interviewed allege that the narrative propagated by McCain, of his five and a half years as a Prisoner of War in North Vietnam is about as far from the truth as one could possibly imagine. They allege that McCain, from the very first moments of his capture, behaved as a COLLABORATOR and propaganda tool for his North Vietnamese captors. Throughout the Paris negotiations, the North Vietnamese tied the prisoner issue tightly to the issue of reparations. They were adamant in refusing to deal with them separately. Finally, in a Feb. 2, 1973, formal letter to Hanoi’s premier, Pham Van Dong, Nixon pledged $3.25 billion in “postwar reconstruction” aid “without any political conditions.” But he also attached to the letter a codicil that said the aid would be implemented by each party “in accordance with its own constitutional provisions.” That meant Congress would have to approve the appropriation, and Nixon and Kissinger knew well that Congress was in no mood to do so. The North Vietnamese, whether or not they immediately understood the double-talk in the letter, remained skeptical about the reparations promise being honored—and it never was. Hanoi thus appears to have held back prisoners—just as it had done when the French were defeated at Dien Bien Phu in 1954 and withdrew their forces from Vietnam. In that case, France paid ransoms for prisoners and brought them home. Bitterly opposed by the Pentagon (and thus McCain), the bill went nowhere. Reintroduced the following year, it again disappeared. But a few months later, a new measure, known as “the McCain Bill,” suddenly appeared. By creating a bureaucratic maze from which only a fraction of the documents could emerge—only records that revealed no POW secrets—it turned the Truth Bill on its head. The McCain bill became law in 1991 and remains so today. So crushing to transparency are its provisions that it actually spells out for the Pentagon and other agencies several rationales, scenarios, and justifications for not releasing any information at all—even about prisoners discovered alive in captivity. Later that year, the Senate Select Committee was created, where Kerry and McCain ultimately worked together to bury the evidence. 1. In Paris, where the Vietnam peace treaty was negotiated, the United States asked Hanoi for the list of American prisoners to be returned, fearing that Hanoi would hold some prisoners back. The North Vietnamese refused, saying they would produce the list only after the treaty was signed. Nixon agreed with Kissinger that they had no leverage left, and Kissinger signed the accord on Jan. 27, 1973 without the prisoner list. When Hanoi produced its list of 591 prisoners the next day, U.S. intelligence agencies expressed shock at the low number. Their number was hundreds higher. The New York Times published a long, page-one story on Feb. 2, 1973, about the discrepancy, especially raising questions about the number of prisoners held in Laos, only nine of whom were being returned. The headline read, in part, “Laos POW List Shows 9 from U.S.—Document Disappointing to Washington as 311 Were Believed Missing.” And the story, by John Finney, said that other Washington officials “believe the number of prisoners [in Laos] is probably substantially higher.” The paper never followed up with any serious investigative reporting—nor did any other mainstream news organization. Here, from CIA files, is an example that clearly exposes the farce. On Dec. 27, 1980, a Thai military signal team picked up a message saying that prisoners were being moved out of Attopeu (in southern Laos) by aircraft “at 1230 hours.” Three days later a message was sent from the CIA station in Bangkok to the CIA director’s office in Langley. It read, in part: “The prisoners … are now in the valley in permanent location (a prison camp at Nhommarath in Central Laos). They were transferred from Attopeu to work in various places … POWs were formerly kept in caves and are very thin, dark and starving.” Apparently, the prisoners were real. But the transmission was declared “invalid” by Washington because the information came from a “third party” and thus could not be deemed credible. After a pause, Alfond recovered and tried to respond to his scorching tirade, but McCain simply turned away and stormed out of the room. The PAVE SPIKE file has never been declassified. We still don’t know anything about those 20 POWs. At Newsday, I wrote 36 columns over a two-year period, as well as a four-part series on a trip I took to North Vietnam to report on what happened to one missing pilot who was shot down over the Ho Chi Minh trail and captured when he parachuted down. After Newsday, I wrote thousands of more words on the subject for other outlets. Some of the pieces were about McCain’s key role. John McCain—now campaigning for the White House as a war hero, maverick, and straight shooter—owes the voters some explanations. The press were long ago wooed and won by McCain’s seeming openness, Lone Ranger pose, and self-deprecating humor, which may partly explain they're ignoring his record on POWs. In the numerous, lengthy McCain profiles that have appeared of late in papers like theNew York Times, the Washington Post, and the Wall Street Journal, I may have missed a clause or a sentence along the way, but I have not found a single mention of his role in burying information about POWs. Television and radio news programs have been similarly silent.